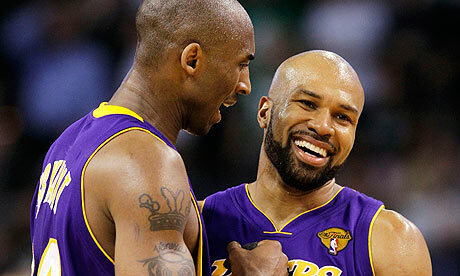 Please Lakers, please… go out there and KILL IT TONIGHT. Play like the championship team you are. Play like the champions L.A. needs you to be. This city could use some heroes right about now. Seeing Kobe out there playing on behalf of his entire team is actually heartbreaking for your fans. Not because we aren’t awestruck by every impossible hoop he sinks – WE ARE – but because watching one man (even the Black Mamba) try to compete with enough passion and heart for an entire team is simply gut wrenching. Please care. More. Please play like your lives depend on it. Even if they don’t. Please be ready to rebound. We could use those little second-chance points. A pack of green and white pouncing under the basket after every missed play is just not cool. Please go out there and represent the hell out of your city. And at the risk of asking too much, please play through the pain. Just two more games (we hope). We PROMISE to do our part – even if we’re too cool for school and don’t always wear the shirts Staples Center hands out. We will cheer you on like nothing you’ve ever heard! From the 10-year old up in nosebleed down to Jack on the floor, we’ve all got your backs. Now get on that court and go have each other’s. Our purple & gold hearts are in your hands. AMEN SISTER!! TEAR IT UP TONIGHT BOYS! !